It’s no surprise that Grand Junction, Colorado—known for its diverse landscapes including desert, canyons, mountains, and mesas—also offers contrasting and unique experiences that showcase another side of the state that you might not expect. Hike along a trail with dinosaur tracks or make your own while skiing at Powderhorn Mountain Resort. Pick a ripened pear from a 40-year-old orchard or sip on one literally grown in a bottle at Peach Street Distillers. Let the river guide you while on a stand-up paddleboard on the Colorado River or hop on the only jet boat ride in Colorado for a heart-pounding excursion. This land of divergence clearly offers distinct activities you won’t find elsewhere in Colorado. And with so many unique options to consider, the toughest part is deciding where to start. 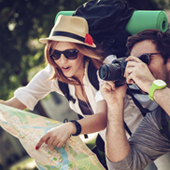 To help you out, we designed this go-to guide with all the details you need to ensure your getaway provides you just the right balance of unique adventure and a peaceful escape, leaving you refreshed and rejuvenated. There are seemingly endless ways to explore the outdoors in and around Grand Junction, but if this is your first visit, you’ll definitely want to check the Colorado National Monument off your bucket list. You’ll find trails that range from easy, half-mile hikes to 14-mile backcountry treks. No matter what you choose, you’ll see the towering cliffs and intricate spires as soon as you drive in, not to mention sweeping views at every turn. Don’t miss Window Rock at the Book Cliffs View Overlook. Independence Monument View, Artists Point, and Cold Shivers are also iconic viewpoints along the Monument. Grand Junction is a year-round outdoor adventure destination. If your trip falls during the winter months, a trip to Powderhorn Mountain Resort is your best bet, considering it is less than an hour from town, spans 1,600 acres of terrain, and averages 250 inches of fresh pow each year. Besides the terrain park, over 30 percent of the ski resort offers challenging runs for more advanced skiers, including Bear Claw, Sweet Misery, and Equalizer. If you like tree-skiing, Powderhorn is known for the best in the state with 1,200 acres of off-piste powder. Want to earn your turns? Backcountry skiing is free here. During the summer, the snowy slopes transform into a downhill biking track. Hitch a ride with your bike on the high-speed quad and then rip your way down on trails that are sure to raise your adrenaline levels! Regardless of the season, the Grand Junction area has a variety of mountain bike trails to explore without the crowds you hear about in other mountain towns. The Lunch Loops are some of Colorado’s best, most technically demanding mountain bike trails and will have you pushing yourself to a new level. Kokopelli Trail Network is full of fast, flowy trails with technical sections, all while providing some of the best views guaranteeing a smile on your face the entire time. Grand Junction is also the perfect place to get out on the water. James M. Robb-Colorado River State Park is broken down into different sections that run along the Colorado River, each designed to provide a different river sport experience, including kayaking, stand-up paddleboarding, rafting, or simply enjoying a leisurely float on a tube. Highline Lake State Park is the go-to lake for locals, while Imondi Wake Zone is the hotspot for those looking to cool off on a wakeboard pulled by cables with ramps to add big air to your jumps. Who isn’t at least a little bit fascinated by dinosaurs? Considering that so many dinosaur bones have been found in this region of Western Colorado and Eastern Utah, it’s no surprise to find a handful of ways to get up close and personal with these ancient beasts. Featuring robotic dinosaurs, a vast collection of fossils, and a real working paleontology lab, the Dinosaur Journey Museum is a great place to start. Sign up for a half- or full-day quarry dig or go out to the Dinosaur Hill Interpretive Trail in the McInnis Canyons National Conservation Area. This one-mile trail is appropriate for all abilities and goes past the site of the 70-foot long, 30-ton Apatosaurus collected in the area back in 1901 by Elmer Riggs. 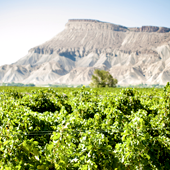 Grand Junction provides Colorado wineries 90 percent of their grapes and local farms ship their harvest to every corner of the state. Of course, this means that area restaurants utilize fresh, seasonal ingredients providing you a taste of the area whether you are sipping a rosé or snacking on gelato made from fresh Palisade peaches. You’ll also find Colorado beef in many restaurants, such as The Winery. Try their blue cheese-encrusted filet mignon or the Colorado lamb chops. This romantic spot is set in a 100-year-old brick building with beautiful stained-glass windows and wood accents, making it the perfect place for a night out. For something a little more casual and unique, stop by Taco Party. Every week they offer a new menu of six appetizers, six tacos, and soft-serve ice cream—all made with an intention to showcase local farmers, ranchers, brewers, distillers, and winemakers. And with options like duck confit, persimmon salsa, and arugula and miso purée, these are not your ordinary tacos. And we promise you haven’t had guacamole like this before. If you’re intrigued by what’s going on at Taco Party, you’ll also like Bin 707 Foodbar. Both are owned by Chef Josh Niernberg, nominated for a James Beard Award, known for showcasing fresh, innovative, and local ingredients. At Bin 707, the menu is seasonal, which guarantees you a quality farm to table experience. Their brussel sprout caesar and wagyu ribeye are the talk of the town, and don’t leave for home without making room for their one constant menu item, the Bin Burger with beehive white cheddar and twice-cooked, hand-cut skinny French fries. 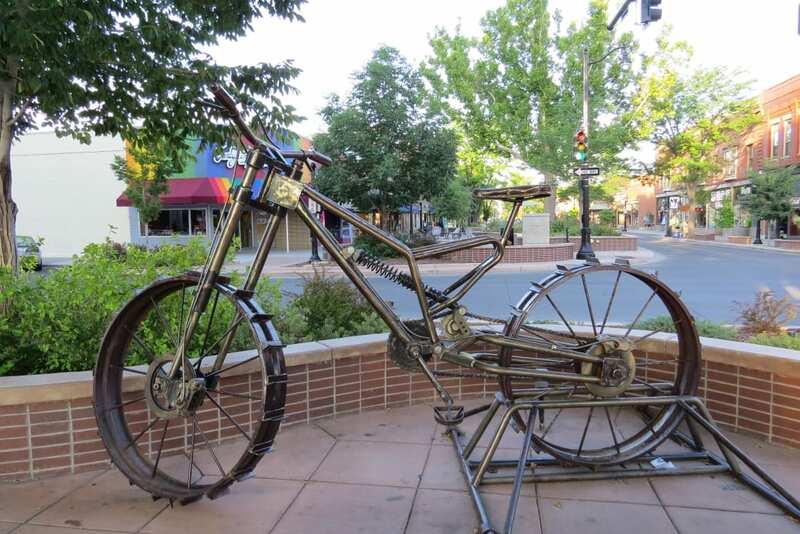 You don’t have to go far to experience the art of Grand Junction. Downtown, a certified creative district, is filled with unique statues and local artwork. Take a walk down the pedestrian-friendly Main Street and immerse yourself in Art on the Corner, a famous collection of over 100 sculptures, perfect for selfies and fun group photos. Close by is the Western Colorado Center for the Arts and also the Art Center which displays several rotating exhibits and will leave you feeling inspired! In the evening, grab a ticket for the Grand Junction Symphony Orchestra, a talented group of area musicians playing at the historic Avalon Theatre, built in 1923. If the symphony concerts don’t line up with your travel schedule, there are regular headliner shows and movies showcased at the Avalon year-round. As you can see, Grand Junction offers authentic Colorado experiences that are unique to this area: trails that provide you the peace and quiet you long for, agricultural bounty of nearby farms and orchards that treat your palate with new and progressive culinary bites, history to bring the past to life, and arts to leave you uplifted. Stop by the visitor center at 740 Horizon Drive right off I-70 or visit VisitGrandJunction.com for more trip ideas and information on the area’s many affordable lodging options. Written by Matcha for City of Grand Junction.